Recent news over the past couple of years on the importance of Vitamin D3 has caused many people to add this supplement to their diet. From preventing the flu to childhood obesity, Vitamin D is very important to our health. Our bodies naturally synthesize Vitamin D3 when our skin is exposed to the sun’s ultraviolet B (UVB) rays (Mayo Clinic); however, winter weather and sunscreen can make such natural absorption difficult. Although it is best to get any mineral or vitamin from whole foods, the next best thing is to supplement. Unfortunately for vegans, it can be a challenge to find appropriate supplements. Each bottle contains a two month supply. 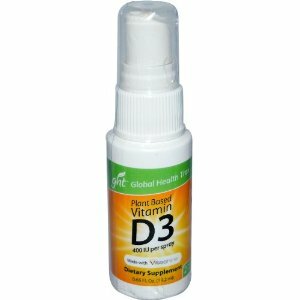 Vitashine is the only 100 percent vegan vitamin D3 product available in North America. The Vitamin D supplement is available in both spray and capsule form. You may take the spray product by either spraying it directly in your mouth or spraying it on food. The unique spray delivery makes it easy to take and quick for your body to absorb. Sales of Vitamin D supplements have skyrocketed since 2009, when a study published in the Archives of Internal Medicine showed that three quarters of Americans suffer from Vitamin D deficiency, which can decrease bone density and weaken the immune system. While Vitamin D3 is typically made by extracting lanolin from sheep’s wool, Vitashine is sourced from a special organic plant called Lichen. Vegan consumers typically purchase Vitamin D2 supplements, which are derived from fungi. However, the results of several scientific studies suggest that Vitamin D3 is 70 percent to 87 percent more potent than Vitamin D2. Until the sun starts shining consistently and we are outside more, I think Vitamin D3 supplementation is a good idea. Nice for vegans. We supplement with a fish oil version. But this company’s dosage is super low. Your body can naturally synthesize many times that from the sun. I would look to at least 400 IU for kids and upwards to 2,000+ for adults. Vitashine also makes a 5000IU D3 vegan softgel which I have been taking for 2 months now. Prior to that I was taking 2000IU D2 daily and never was able to achieve higher than 31ng/mL 25-OH-Vit D in my blood in the 2 years I’ve been getting test (N=4 test results). I just got my blood tested last week, but haven’t gotten the results back. We’ll see….